Thought I would show you the inside of my Latvian Garden today. This is the inside of the front center. This design was fascinating. 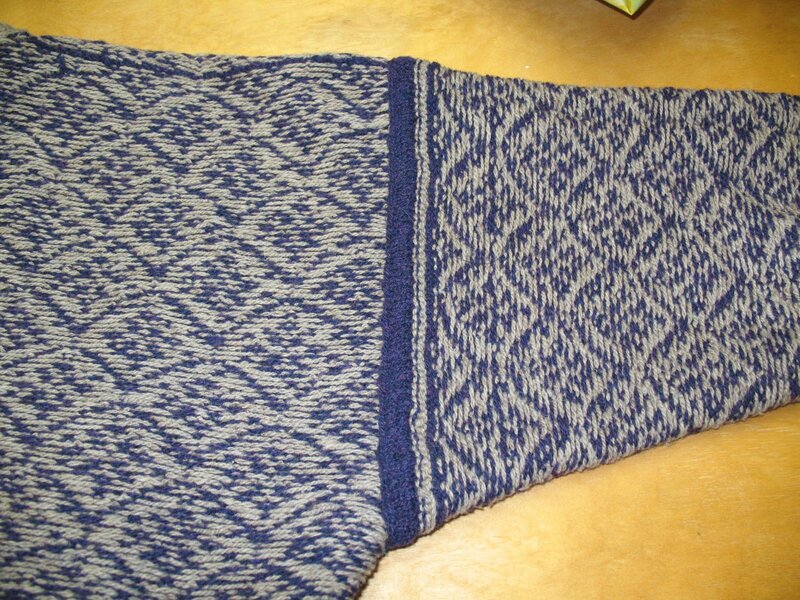 I began by cutting a steek up the center as you would expect for a cardigan. 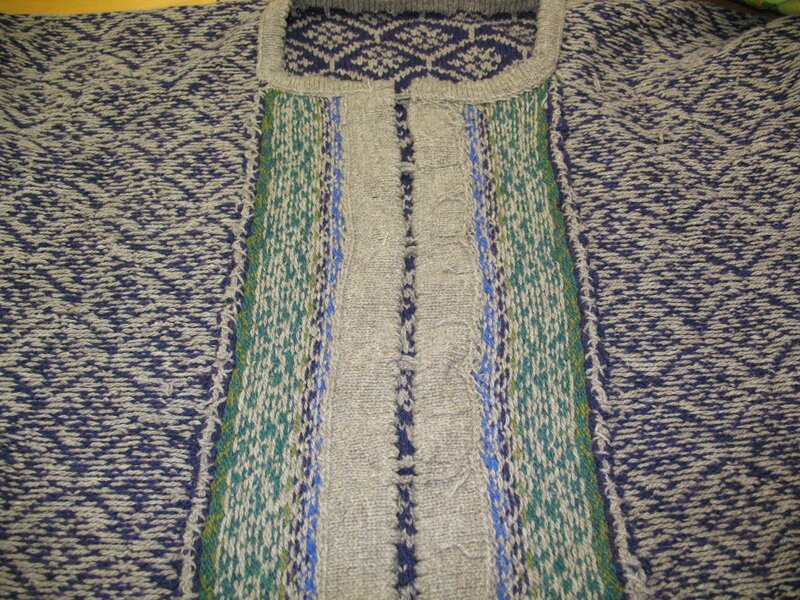 Then after picking up stitches along the right front edge for the button band I added steek stitches across the neck opening then picked up along the left front band and added more steek stitches to bridge the gap at the hem edge. Clear as mud, right? Then I worked out for the front band inserts and the picot edge and facing. I cut open the steeks at the top and bottom of the sweater, tacked those down and then turned the facing in to cover everything up. Very neat and tidy. Picked up for the neck edge, increasing and decreasing at the corners, picot edge, knit the neck facing and tacked in that cut edge. At the hem I used a provisional cast on so when I was finished with all the finagelling at the button bands I put the provisional cast on stitches on a needle, picked up the new button band stitches and knit down for a hem and another facing. There was a lot of detail in this garment. I wore this sweater in February to the Pittsburgh Knit Conference. I attended with a good friend who wore a simple garter stitch scarf. She was receiving compliments left and right and no one said anything about my sweater. She was very sweet and said she didn’t think anyone believed it was handknit. I think I am going to stick to much simpler knits from now on! In other news, I am replacing this with the one below. 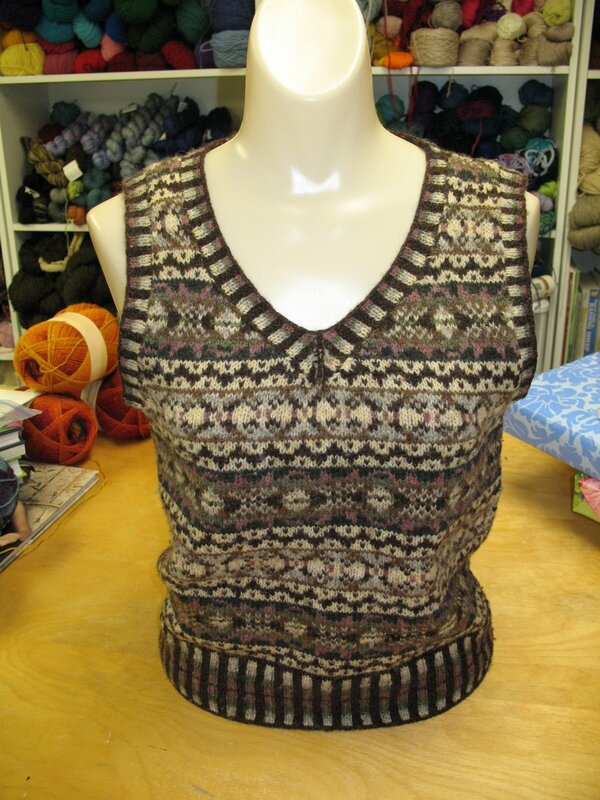 I made this vest for my oldest daughter when she was a junior in high school. She is currently a 4th year architecture student in college (it is a 5 year program). She has worn her vest for many big events in her life, college interviews, architecture critiques, job interviews. She still loves it but now that she is a little older and will soon be going out into the working world she wants something a little longer. She has long torso. She also asked for some updated colors. 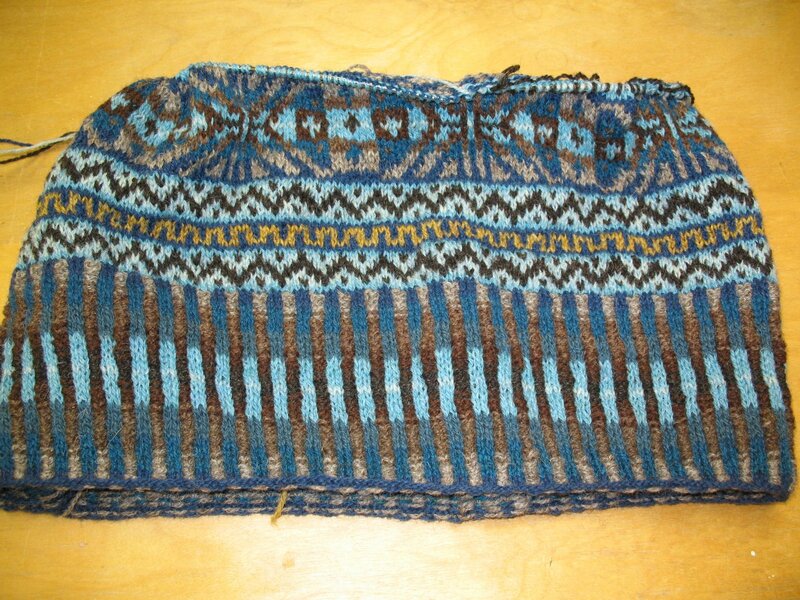 I know she loves chocolate brown and turquoise so I did some stash diving and came up with enough leftovers for a new Fair Isle vest. I think the yarns are a combination of Alice Starmore’s, Jamieson, and Jamieson and Smith shetland weights. Don’t have a clue on the colors because the bands are long gone. Started on size 3 turbo’s but it didn’t have enough negative ease for her so ripped back to the corrugated ribbing (done on #1’s) and began again on #2 turbos. Hope it is done soon. Lots of luxury yarn calling out that wants to be lace. Must finish vest, must finish vest.